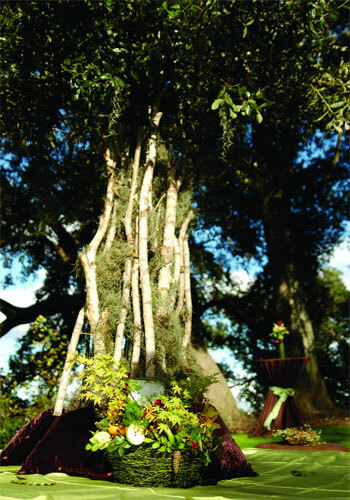 Fantasy buffet under the oaks. For a truly enchanted wedding day, designer Tally Angle of Distinctive Events swears that the best place to find magic is the natural setting of the Lowcoun-try. 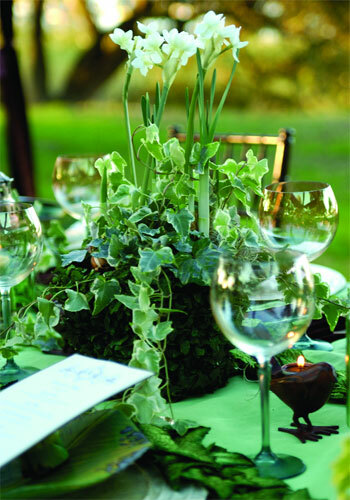 For her whimsical woodland reception, a private garden is perfectly suited to accommodate an intimate outdoor gathering of 30. 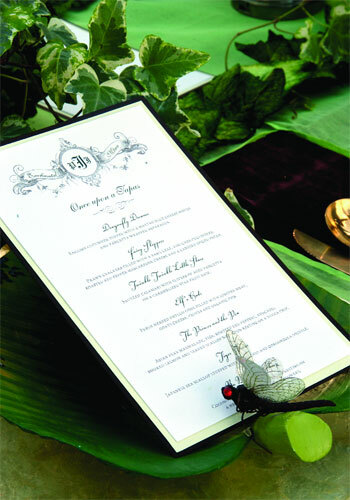 Introduce your theme or colors with the invitations, says Angle, who adorned these with oak twigs and Spanish moss. 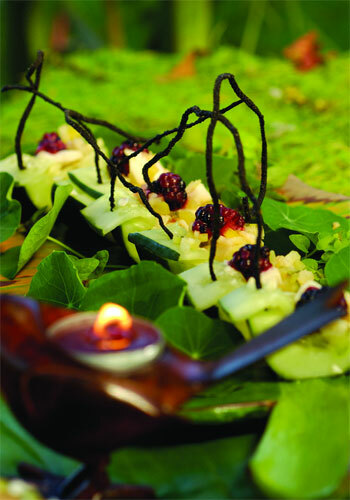 “It begins the story and entices guests to enter the earthy brown and bright, spring-green fairyland.” DECOR Chocolate-colored velvet draped from oak branches creates an intimate garden room, while ribbons of ivy and green organza runners form thatched grids of place settings. Bamboo vases display the bridesmaids’ bouquets. 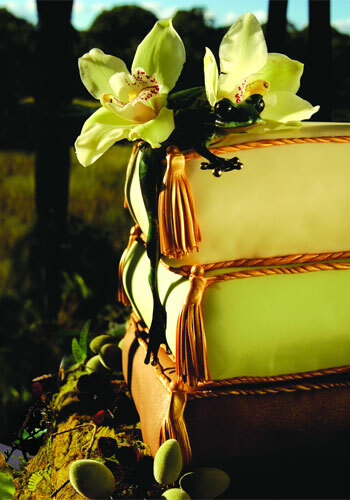 Encased in braided narcissus, the fairyland clusters reflect the natural theme with orchids, brazilia and coffee berries, acorns, and bells of Ireland. 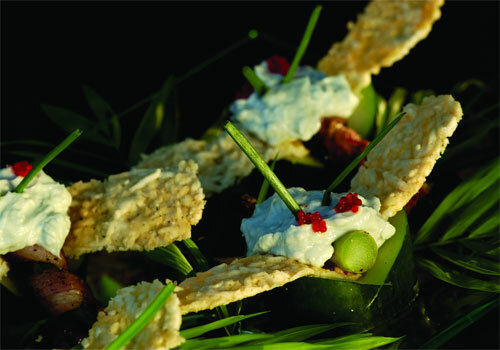 In lieu of a heavy meal, tapas are a great way for guests to try a variety of lighter dishes. Pacific Dreams Catering created an inspired buffet, which featured delightful treats ranging from “Fairy Slippers” (prawn crackers filled with basil, roasted red pepper mascarpone, and a candied spiced pecan) to “The Princess and the Pea” (Asian pear marmalade, fig, avocado, smoked salmon, and seared scallop napoleon on a yucca chip). 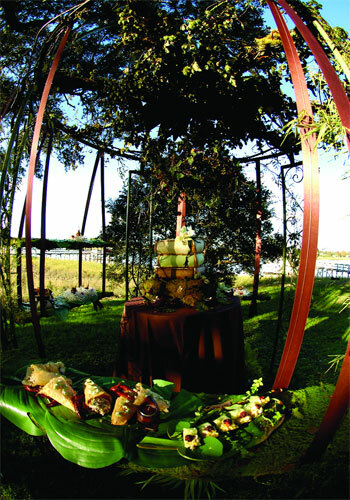 Unlike a fairy-tale princess, a bride who chooses an outdoor wedding in Charleston must consider that her guests won’t appreciate getting wet or being surrounded by bugs—so always have a rain alternative. 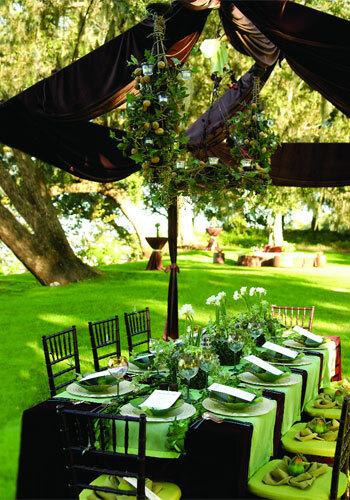 For smaller receptions, a porch or piazza still harmonizes with the natural environs; for larger gatherings, a tent is more practical, but draping it with velvet can be costly. 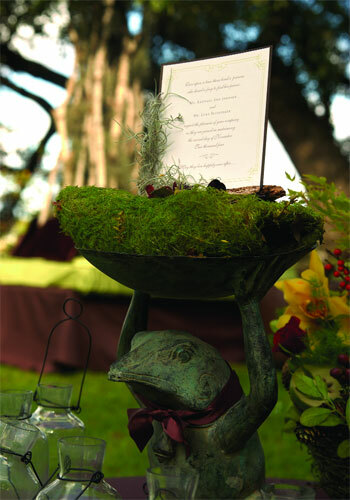 Angle recommends using wire and monofilament to create espaliers of moss and branches so that “people feel like they’re out under the trees, not under a tent.” To eliminate pesky mosquitoes, have a pest control company spray the area prior to the ceremony. 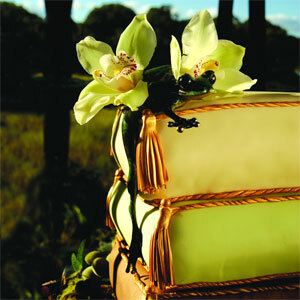 It’s also a good idea to place baskets of paper-wrapped insect repellent near outdoor bars.